I find the visual system fascinating. Ophthalmology blends medicine and surgery, and is a field where we can make a real difference in the lives of our patients. Zac B. Ravage, M.D., is an expert in the medical and surgical treatment of retinal disease and injury, with particular expertise in the treatment of diabetic retinopathy, retinal detachment, epiretinal membranes, macular holes and age-related macular degeneration. Dr. Ravage is also an Assistant Professor of Ophthalmology at Rush University Medical Center in Chicago. He joined Illinois Retina Associates in 2007. A native of New York, Dr. Ravage graduated from the University of Michigan with a degree in biology and cultural anthropology. 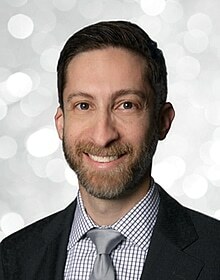 He earned his medical degree from Sackler School of Medicine at Tel Aviv University in Israel and performed an ophthalmology residency at Case Medical Center in Cleveland, Ohio. Dr. Ravage completed his fellowship in vitreo-retinal medicine and surgery at Illinois Retina Associates and Rush University Medical Center. He is certified by the American Board of Ophthalmology. A dedicated clinical researcher, Dr. Ravage has been involved in a number of clinical trials, including those involving treatments for macular degeneration and diabetic retinopathy. He has written several articles that have appeared in academic specialty journals. Dr. Ravage also has presented at international ophthalmology conferences on such topics as the efficacy of emerging therapies for neovascular AMD. He is a member of numerous professional societies and organizations. Dr. Ravage is on staff at several area hospitals and sees patients at Illinois Retina’s Chicago Loop, Skokie and Libertyville office locations. Dr. Ravage’s background in cultural anthropology has led him to pursue an interest in international medicine. He has traveled overseas to remote regions of the Himalayas, where he has volunteered his expertise as both an ophthalmologist and clinical instructor. When he’s not seeing patients, Dr. Ravage serves as team ophthalmologist for Chicago White Sox baseball and Chicago Bulls basketball. In his spare time, Dr. Ravage enjoys running and participates in local races. A sports enthusiast, he follows professional and college teams, especially his alma mater – University of Michigan football. He is also a music aficionado and enjoys Chicago jazz.